The penultimate zoo of zoocation 2013 was the fabulous Dickerson Park Zoo in Springfield MO. A huge shout out to Erin Sorensen and Pam Gwin for making our visit so very memorable. They were super generous with their time and spirit. We got to feed Henry the hippo, tickle a few black and white ruffed lemurs, hold a joey and nuzzle an Aldabra – memories that will last a lifetime. This zoo packs a big punch and if you are in the area I urge you to visit. We sure did have special fun!! Thanks again too, Erin and Pam. Hi Henry! 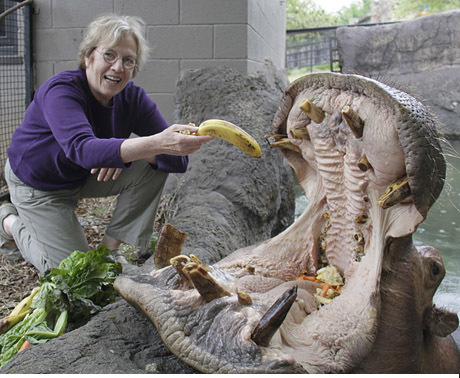 Now that is some hippo shot. Wow!